Ready to eat more fruits and veggies? 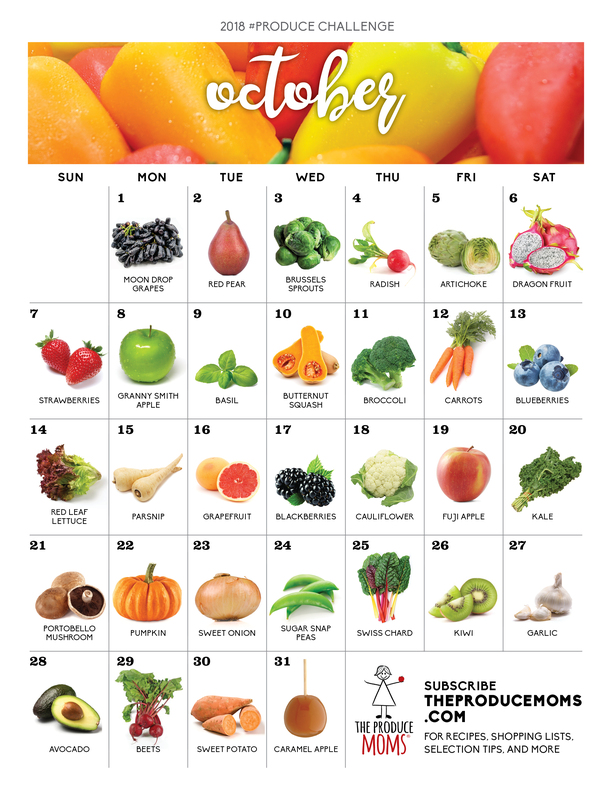 Join the October 2018 Produce Challenge! The October 2018 Produce Challenge is here and it’s full of fall goodies and year-round favorites! Use the October Calendar as your shopping guide this month and challenge yourself to eat a different fruit or veggie each day. Be sure to join our e-newsletter (subscribe below) to receive recipes the whole family will be excited to eat, plus fun facts, selection tips, produce tutorials, encouraging words, and more! When you subscribe to the #ProduceChallenge, you’ll receive weekly e-newsletters with delicious recipes, produce tips, cooking tutorials, and inspiration. Be on the lookout for special events and giveaways too! Join the Challenge to receive a weekly e-newsletters that contain family-friendly recipes and produce tips & tutorials that make eating more fruits and veggies easy. You’ll also learn about how your food is grown and hear from other Produce Moms just like you. To join, complete the short form located above. It’s 100% free! Which items on the October calendar are you most excited to try? Share in the comments below along with how you plan to serve them. I’m posting the calendar in the lunch line for students to see, on our Wellness Bulletin Board and in the teacher’s lounge in the school. Keep ’em coming! They are colorful and eye-catching. I also plan to send the calendar home with our monthly menu email for parents. Thanks, Kathleen! If you aren’t a part of our food service co-hort, we would love to add you. Please email Kristin – kristin@theproducemoms.com if you are intersted! What a fun idea! Going to print a copy to hang up at home so the kids can see what new and colorful foods we get to try!